When I opened the box I was impressed with the numbers of sprues. At first glance it did not appear that this was going to be too difficult of a build. However, I later discovered that my assumption was incorrect. There are a lot of parts to put together, and you must be ready to devote some time into this model because it will take a while to complete. With that said, let's get on with the good stuff. Here is a breakdown of the items in the huge box. 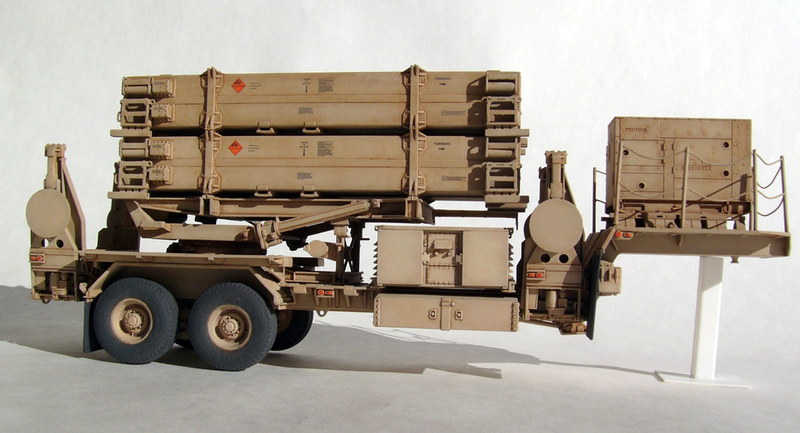 The MIM-104 Patriot is a surface to air missile system, used by the United States Army and several allied nations. It is manufactured by Raytheon. and derives its name from the radar component of the weapon system. 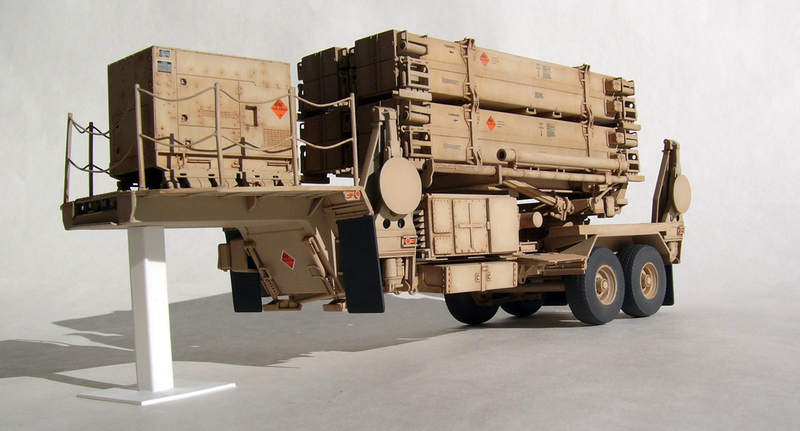 The AN/MPQ-53 is known as the "Phased Array Tracking Radar to Intercept On Target" hence the name PATRIOT. 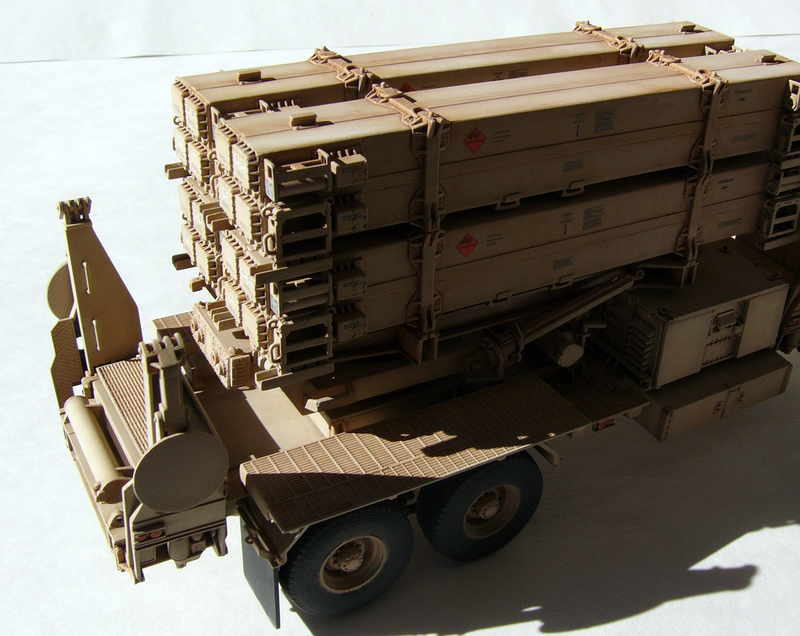 The Patriot System replaced Nike Hercules system as well as the MIM-23 HAWK system in the role of the U.S. Army's Air Defense Additionally, Patriot has been given the function of the U.S. Army's Anti Ballistic Missile system, which is now Patriot's primary mission. I use several types of cements, most notably Tamiya Thin Liquid cement and Testors Model Master liquid cement in the black dispenser bottle with the syringe type applicator. The paints used on this model were primarily Mig Ammo paints, Mig Abtelieng Oils and Mig Pigments for the sand fade. I find that I truly like their color selection and durability of and find myself using them more and more. Assembly begins with the trailer unit. I encountered no issues whatsoever. The parts are molded in Dragon's usual flash free fashion with good detail. I would like to point out that when gluing parts B2 and B30 to A25, make sure you get the parts aligned as straight and as clean as possible to avoid having to sand and fill a seam on the bottom of the trailer later. You also must decide whether or not you want to have the trailer stands in the up or the down position. I chose to put mine in the up position and I am hoping the Dragon will release the HEMMTT later so I have something to hook my trailer to later. If not I may be forced to get a HEMMT from brand "B". The suspension is well detailed and goes together with no problems. In Step 2, parts I28 through I30 which are used to assemble two side stowage boxes look great, but they have no backs and you may wish to make backs from sheet styrene. I usually don't complain, however, this was one of my issues with this kit. In step 3 you construct the walkways and details on the top primarily around of the trailer edges. The parts are well molded and detailed. My issue is that on the actual Patriot, the walkways are grating that is see-through and on the kit they are solid. I would recommend an aftermarket set to correct the appearance. I have seen them available, and this would greatly enhance the detail of the walkways. I chose not to cable this build so anyone reading this review can see the kit as it builds out of the box without any added details. I also recommend that you leave parts F28 and the cabling around the front of the trailer off until the very last, as it is very fragile and easily broken. I broke most of the posts on mine and had to glue them back a couple for times when I was applying washes etc. Once you complete step 3, you start to see the trailer taking shape. The Support legs are assembled as a subassembly, and you must choose whether or not you want them raised or lowered. I chose raised so I can attach mine to a HEMTT later. The parts fit well and the assembly is not too difficult. I did find the instructions absolutely confusing as to how to properly place parts G26 and G27. I consulted other printed matter and photos to finally figure out the correct orientation of these parts. The subassembly F for the wheels had fit issues. The DS tires simply do not fit well on the wheels. I added .010 strip of evergreen plastic to the front edges of the wheels and sanded them flush. This was a simple fix, gave a nice snug fit to the tires and I was back in business moving along. The rest of the step was a breeze. The generator and electronic boxes all assemble nicely and have great detail. You can leave the doors open of you choose as there is detail behind the doors which is a nice touch. 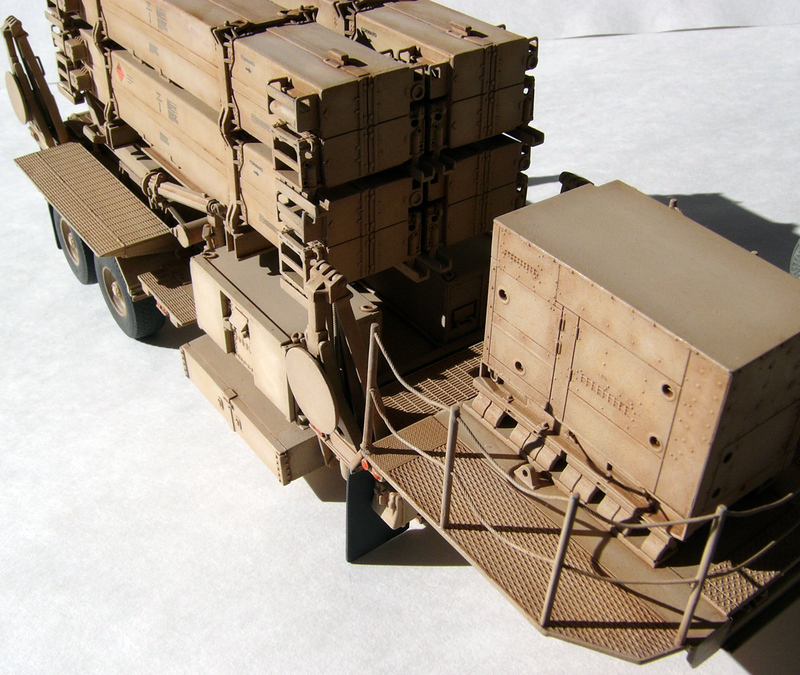 There are also cable attachment points on all the equipment boxes as well as the generator which, if you choose to cable your Patriot, you can spend some happy hours running the cables to and fro about the trailer to the missiles, etc. I chose not to cable this build so anyone reading this review can see the kit as it builds out of the box without any added details. Each of these generator and electronic units were set aside to be painted as subassemblies. 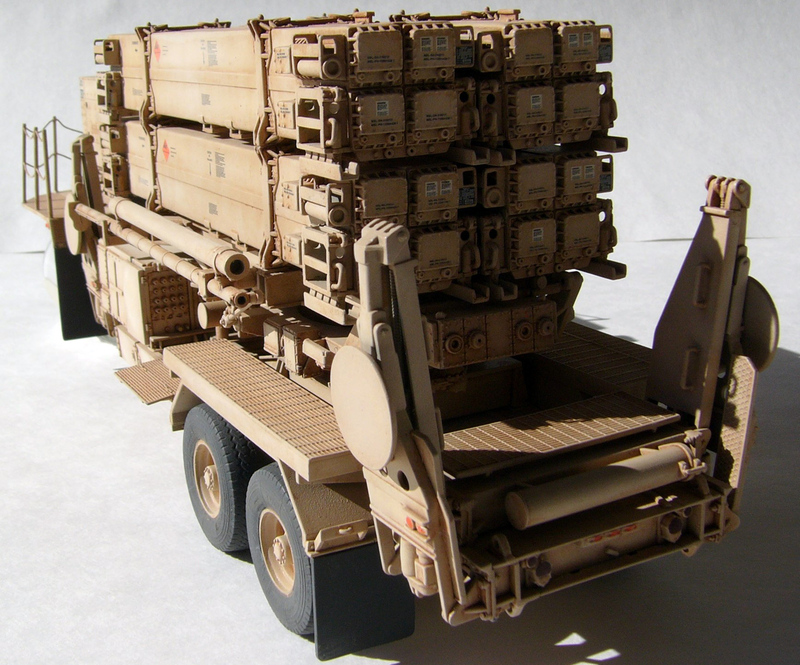 Now starts the assembly of the missile support platforms. I encountered no issues during these steps and the parts are well detailed and fit excellent with the exception of part C14 which we covered earlier and should be a grated walkway. You can also assemble the unit to be moveable. Once these two steps were completed, I set this to be painted as a subassembly. Construction of the missile boxes is very straight forward. You have an option on the front of the missile box to choose to have one of the doors open and a Patriot missile firing out of the box. Very neat option that would be great if it is in a diorama setting. You should also be very careful here to glue accurately and carefully making sure they are straight and tightly glued to avoid having to fill seams on 4 missile boxes later. Also, make sure you get all the front missile doors and the rear parts of the boxes oriented in the same directions on all the boxes. Let them dry completely! There are also very small pins that protrude from parts I3 and I4 that are used to align the missile boxes when placed on top of each other. They are extremely fragile and easily broken. After breaking two or three off mine, I chose to drill holes and replace them with small brass rod after the missile boxes were dry. 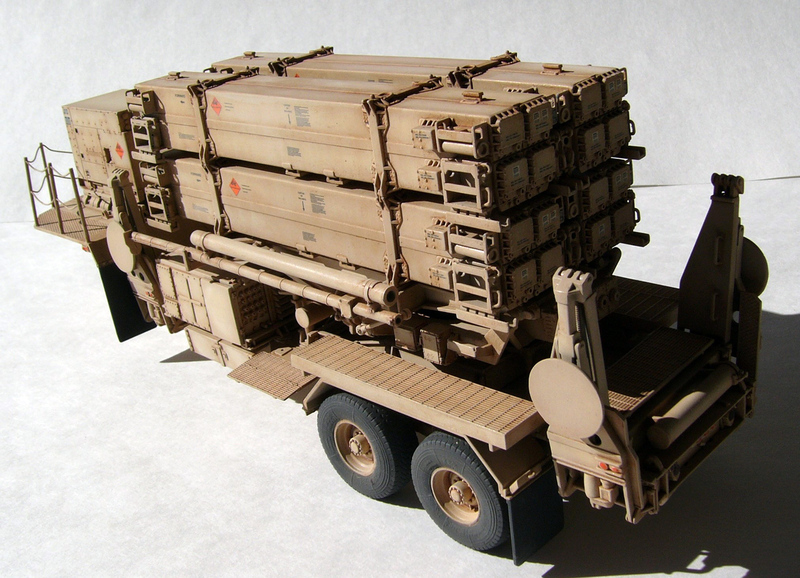 This is a very straight forward assembly that supports the missiles on the trailer. All of the parts fit well and no problems were encountered. The details to the missiles are added. There are lots of various details and they consist of 4, yes 4, sprues of detail parts. The assembly of these parts is time consuming and fiddly, but it is well worth the effort and the missile boxes look great when finished. The assembly in step 13 attaches to the missile support assembled in step 11. All the parts fit well and no issues were encountered. I chose to set these part "O" and "P" in step 14 aside as a subassembly for painting. I also chose to paint each missile box separately. Parts D11, A22 & D25 were painted individually and glued on during final assembly. I did not use part D3 because my model is march ordered ready to connect to a HEMMT. I primed all the subassemblies with black and allowed it all to dry overnight. 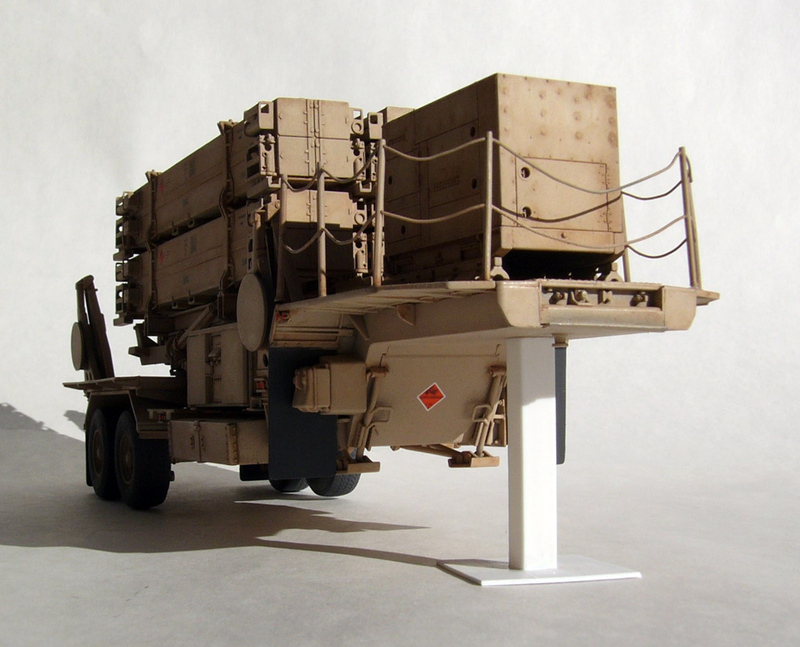 The model was then given several mist coats of Mig U.S. Modern Vehicles 025 Tan, followed with a panel fade (cloudy overspray) of the same color lightened with about 25% of Mig 050 Flat White. I then hand painted all the lights with appropriate colors. The tires were painted Mig Rubber Tires 033, which is not black but rather a dark grey, and in my opinion it looks a lot more like rubber than flat black. The model was given a few light coats of Pledge floor polish to give a nice glossy finish for the decals to adhere to, and once dry, the decals were added. After settling down the decals with Gunze Mr. Mark Softener, another coat of Pledge was sprayed over the model to seal in the decals. 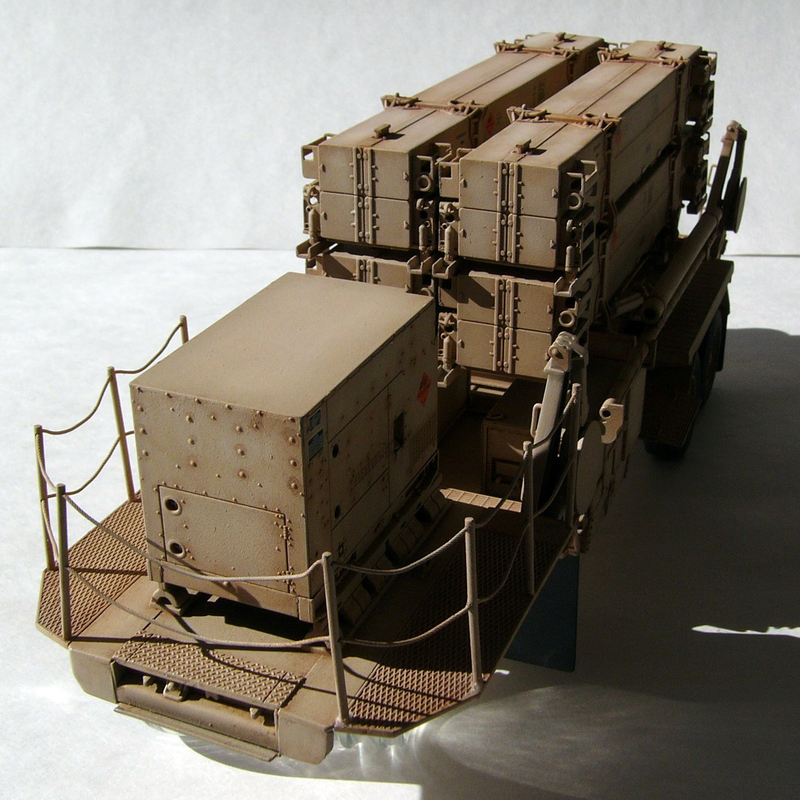 The model was given several light washes of Mig Abteilung 502 wash brown mixed 95% thinner to 5% paint. The mixture was very thin and brushed on to change the tone of and blend the paint colors. This was allowed to dry overnight. The model was then given pin washes of the same color and this was allowed to dry overnight as well. The model was given a coat of Testors dull coat and allowed to dry overnight. The model was dry brushed with Buff Titanium oils and allowed to dry overnight again. Once thoroughly dry, I applied Mig pigment 3012 Sand to the center of panels and in various area to represent fading. I really enjoyed building this model and would recommend this to anyone wanting to build a nice Patriot. The detail level is very good and the overall finished model is nice. I would also like to thank Dragon Models and the IPMS reviewers corps for giving me this opportunity to build this wonderful kit. Should you choose to build one, you can obtain this kit from the Dragon website at http://www.dragonusaonline.com Simply place kit number 3563 in the search box and bam, there you have it. The actual kit number is DRA-3563. Model on!!! !